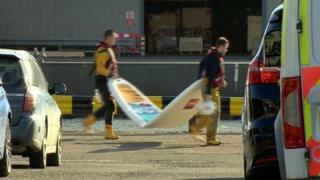 Three paddle boarders have been rescued by lifeboat after getting into difficulties in sea off Aberdeen. A number of 999 calls were made after members of the public saw the group get pulled out to sea in windy conditions at about 14:30. They were picked up by the RNLI's inshore lifeboat then transferred to the all-weather lifeboat. The group, all women aged about 19 or 20, were checked over by ambulance crew but did not need medical attention. Their boards and paddles were recovered. A spokesman for the RNLI in Aberdeen said: "The prevailing strong offshore winds, and their consequence in blowing these paddle-boarders offshore, serve to remind us all of the importance of obtaining a weather forecast and considering its implications before embarking on any leisure activity in the sea."